I happy to introduce and review the very first Pusheen Subscription box. Pusheen is a seasonal subscription box so you get a new box every 3 months. In the boxes you get cute items that could be inside include clothing, accessories, electronics, toys, stationery and more! For the quarterly plan the price is $43.95 USD per box and for the annual plan it is $39.95 USD per box. For shipping in US the shipping cost is $6. For shipping to Canada shipping cost is $20. This is the box I got. Isn't it so cute? The box comes with a product card. The cutest USB memory stick ever!! I love this 4GB memory stick. Pusheen cards. They also came with envelops but I forgot to add them to the photos. This toque ( to you Americans out there that is how we call beanies) is just so adorable. giving these to my niece. I know she will love them . The very first Pusheen vinyls toy. Well, there you have it folks. All the cute products that came in the first Pusheen box. Did I like this box? Yes I did. 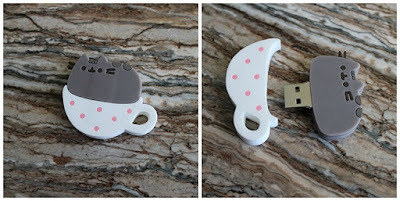 I think it is fantastic who love Pusheen. Do I think it is worth the price. I do think so especially since the items are not things you would find in stores so I do recommend this.